Why make a unique birthday greeting card that looks like a purse? In truth, using a theme or fashion symbol that the celebrant loves is one of the coolest ways to make a birthday greeting card. However, take it to the next level by adding a unique feature to the card. 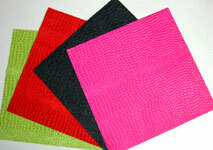 In this case, a leather-textured purse card for that diva you know is an awesome way to go. By the way, this kind of material is available in craft stores. If a purse won’t do the trick, think of another fashion symbol like a unique belt birthday card. Another point of making a cool card like this is that you can use the concept to create the greeting card message. 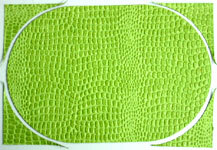 Glue the green leather material onto the green cardstock paper. 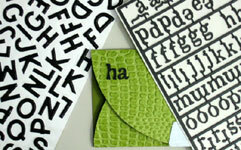 This rigid card stock firms up the leather material. From this, cut out a 8” x 12” piece. Using the 8” diameter curves, draw and cut out all four corners. Score and fold this piece into a 4” x 8” pamphlet fold card format. On the metallic cardstock, draw and cut out a trapezoidal buckle with 1.5” top, 2” botthom, and ⅛” radius corners. Glue this piece on the bottom of the card cover. 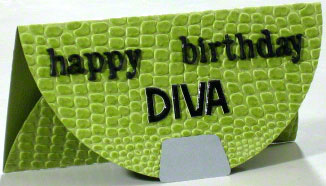 Finally, using the 3D letters, create “Happy Birthday Diva” on the card. There’s probably no way to clean pencil marks after gluing the letters. Hence, instead of pencil marks, use solid object like ruler to align the letters. Feel free to apply your creativity inside the card. For example, use purse art and graphics sheets and stickers to create items you'll find inside a purse. Instead of circular or curved edges, a different option is slant edges. Also, if a purse is not the celebrant's favorite, try a belt birthday card or something else. 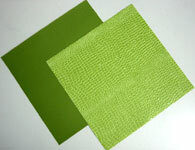 Finally, If green is not the celebrant's favorite color, there are so many other leather colors to choose from in the craft stores.